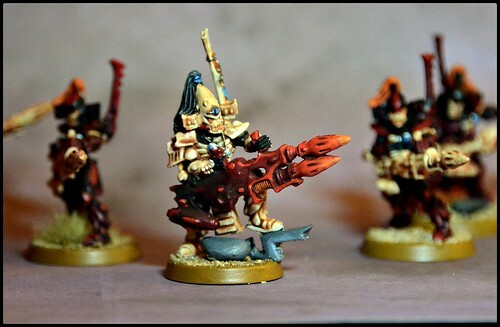 As mentioned last week, a unit of Dark reapers were next on the painting agenda. I was pretty pleased with the final results. Again I wanted to make use of a kind of inverted colour scheme for the Exach, to make sure that they stand out from their unit, and for some reason I really like the bone inspired theme for Eldar weapons in general, given their background fluff, and in particular for Dark Reapers given the skull motif in the casts. A couple of people on Twitter asked about how I paint, and how I approach these models, so this time I took a couple of 'work in progress' shots. These were also an interesting choice, as units which predominately have a darker scheme often present a challenge to paint. Then after it's dry I will apply an ink layer, a sepia or flesh tone for the bone, and Nuln oil for the red / black. This nicely fills in the recesses and gives the nice deep contrast on the miniatures, that can then be brought up even more with highlighting. So then I start highlighting up with the original red colour (in this case Khrone red) and then add another brighter red or orange. Then I simply go around and fill in the details (gems, ties, holsters etc) before basing them. I used the same technique on the Exarch, blending the black up to reds and oranges for his weapon, just brought up quite a bit brighter at the tips of the weapon. Then most of his body was a case of ink washes over bone. generally I go over a few stages highlighting with bone or white, and then inking again to build up darker areas. Overall these ended up working out pretty well. I think I liked the Scorpions more overall, because the green worked so well, but these Reapers should still look pretty good on the battlefield!